The story of Modern Combat 5 and surrounding cyberterrorism, as you might imagine, a plan to overthrow world powers. During a conference in Tokyo, where many leaders are meeting to discuss digital security, a terrorist attack puts in check the name of Gilman Security firm for which Phoenix, protagonist of the game, works. However, it seems that the Phoenix Company is behind the attack. To find out what's really going on, the character combines Tukura and Roux, and depart in an investigation that connects the vice president of Gilman Security and the terrorist leader. Who played Modern Combat 4, will immediately recognize an old enemy. Everett Saunders, will be active again and this time he will be the main villain. Also, the game keeps other surprises in the story. Modern Combat 5 has no longer those complex missions that could last more than 20 minutes and had several checkpoints. Gameloft decided to remove it to leave the campaign more attractive way. The long missions from previous games have been replaced by short assignments with multiple levels of awards. Something similar to casual games, where the player has to conquer the 'three stars' in each phase. After passing through the first mission, a map is displayed. Each has major missions, marked with a golden badge, and side missions. To continue the campaign mode, you need to at least finish the main missions, and most secondary. This change made the campaign more inviting way to the replay factor, because the points earned in that way can be used in multiplayer mode and vice versa. Some missions however, were quite repetitive, as in what it takes to blow up doors and shoot the enemies in slow motion. This also left the game with a face of casual game. 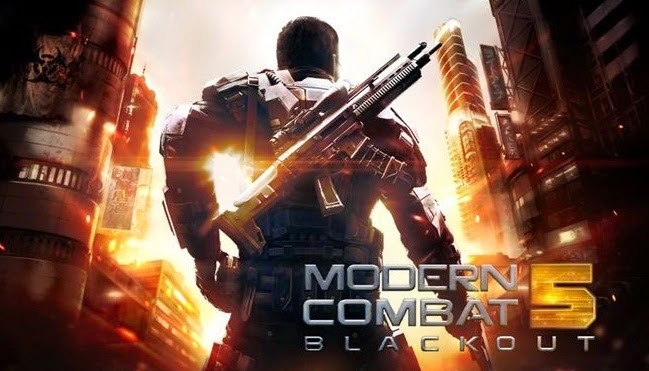 Although it has no built-purchase, which is something commendable, Modern Combat 5 can turn a free game in the future, because all the "ground" for it to be free-to-play is already mounted. The missions are short and generally easy. What is striking is the variety of them. There are missions aboard boats, cars, thrilling chases and too much shooting. One of the novelties are enemies using powerful armor and carrying weapons. A good variation for those already tired of just killing "soldiers". However, in the real world, there is a lack of fighting against tanks or helicopters that do not exploit with few shots. The narrative follows the old style of "Super Soldier." Something that looks good for a casual game, but it makes her totally expendable characters. Part in the shooting, Modern Combat 5 follows the theme of "guerrilla" and less war. There are no vehicles to control, or strategic missions. The shooting is always the same, where you do not need to think too much and just send the bullet enemies. There are some missions where you act as "Sniper", but are quite rare. The campaign mode seems well crafted, but as this is the fifth game in the series, comes a time that the player looking for something new. Unfortunately, the shooting of the campaign mode remains at the same level as in previous games. The only thing that was vastly improved enemy AI. Now they do not go as cheap dizzy toward his sights. Missions in Tokyo, for example, you can see the enemies running away from grenades and hiding when you start crossfire. Gameloft hid the run button, and now your soldier runs when not shooting. Fortunately all setting buttons can be edited at will. The assistance of sight is also less active. In fact, almost no one realizes when assistance is enabled or not. One of the major novelties of this fifth version of this game for smartphones are the classes of soldiers. Available in both modes, single player and multiplayer, classes allow to diversify the gameplay by changing the characteristics of each soldier. They are: Assault, Heavy, Sniper and Recon. You can play with any class, in both modes. Beginning in multiplayer can be a bit boring. All because there will be several players already at levels more advanced than you. The game does not differentiate who is at a higher level of novice players, and often, you will face opponents with better skills and better equipment than yours. An example is the Recon class, which has specific skills for multiplayer mode. Three of them allow to improve the radar, which will be crucial in small environments maps, which is precisely the case of three of the four maps Modern Combat 5. Another thing that can be good or bad is the drone, which identifies the enemies through walls. It lets you see the opponents, even when they do not appear on radar, and eliminate them by shooting only the wall. In the middle 2014's almost impossible not to miss some small things in Modern Combat 5, one of them is the gun's recoil that seems to have disappeared. Another is that there is no possibility to choose the knife, even throw it. Interestingly, the edit controls, you can see the button throwing knife! You can also miss the vehicles, although that seems inconceivable in only four maps Modern Combat, this feature is used in games Blitz Brigade and NOVA - both Gameloft and released before Modern Combat 5. Modern Combat 5 is a game made to run on a wide variety of devices. Because of this, the visual quality of the game varies greatly. IPhone 5S or iPad Air, the game looks very nice, but not enough to cause the impact of Modern Combat 4: Zero Hour. The visual impression can be bad if the player running the game on a median unit where various visual effects are turned off. This makes Modern Combat 5 looks lower than the previous title in the series. Unfortunately, this may be the reality for many people. Perhaps one of the most prominent weaknesses in Modern Combat 5 is the requirement to have activated the internet all the time anyway. The thing still gets a little annoying when you realize that the requirement is not in vain, the game even need Internet to download additional content such as stages and even the multiplayer mode. There is no alternative to play offline. If the player is on the 3G / 4G and the signal vary minimally, the image is displayed below, until the signal again. Depending on the quality, is something very frustrating. This makes gambling Modern Combat 5, something essentially "indoor". Modern Combat 5 is packed with new features, some good, some not so much. However, the lack of original ideas is one of the critical points of the game. Not long before the player have the impression that you are playing Modern Combat same as before. Overall, the experience from the previous title does not seem to have evolved, and at times, it even seems a little worse.